We offer logistics solutions for the renewable energy industry, handling customs clearance and door-to-door delivery of all types of components and machinery. We have expert staff dedicated to handling these types of projects, in addition to our Project Cargo division, which specialises in the transport of industrial projects involving oversized and heavy cargo. We specialise in renewable energy logistics and can transport all of the components required to set up and maintain your renewable energy plant. WHO ARE OUR LOGISTICS SOLUTIONS AIMED AT? The scale and the cost of the project are usually the main factors which determine whether it is the manufacturer, the EPC firm or the developer who takes on the responsibility and the risks involved in supplying and transporting all of the materials and machinery required to carry out the project. EPC: firm responsible for a project and in charge of the design, construction and supply of materials. Shipping is the main method of transport used when a renewable energy plant needs to be set up and maintained due to the large amount of equipment involved, its size and the distances covered. Urgent shipments to send replacement components and maintain the plants. Air freight is the fastest way to cover long distances between suppliers and the site or plant. If your materials come from different suppliers, multi-supplier consolidation is the best logistics solution for the renewable energy industry. We group the goods from your various suppliers together so that containers are transported carrying only your cargo. This leads to significant savings of time and money given that once the containers have arrived in port they are transferred directly to your warehouse, thus reducing destination handling costs. We offer advice on documentation, customs processes and procedures as well as on any potential tax and customs advantages available. For example, the owner of a renewable energy plant could be entitled to preferential customs tariffs set out by the country of destination under a special customs scheme for imports of material as capital goods or fixed assets. We resolved the complex problem of how to transport a wind turbine nacelle in a convoy the size of a football pitch. At the request of an international Italian manufacturer of inverters, transformers and string boxes we transported over 400 TEUs, both SOC and COC, door to door from Italy to the site in Chile between June 2015 and March 2016. Containers left from the ports of Antofagasta and Angamos and were transported to the commune of María Elena in the Tocopilla province in the northern region of Antofagasta (II) and to Carrera Pinto in the commune of Copiapó in the Atacama region (III), Chile. For this project, an EPC firm from Greece hired us for the door-to-door transportation of transformers from Turkey, cable from Italy and machinery from Spain, making up a total of approximately 150 TEUs in special equipment (open-top containers for out-of-gauge (OOG) loads), dry cargo containers and Ro-ro cargo to the Sierra Gorda commune. A project for a Spanish EPC firm in which we carried out a door-to-door service from Spain to Mexico, including customs clearance in both countries, to transport a total of 800 TEUs of cable, corrugated tubes and fencing for a solar farm, which will be the biggest in Latin America. Latin America is currently the main investor in renewable energy plants and it is expected to build farms totalling 10GW of energy in Chile, Argentina, Mexico and Colombia over the next five years.. The figure of 10GW refers to projects averaging 100MW, though there are many much smaller projects of between 2-3MW which are difficult to quantify. A year ago, Law 27.191 was passed in Argentina stipulating that as of 31st December 2017 renewable energy shall contribute up to 8% of national electricity needs, and that this figure should rise to 20% by 31st December 2025. Furthermore, any consumer using more than 300KW shall be obliged to generate 8% of the power they use by means of renewable energy. This implies the construction of 2.6GW in small projects in the sector. In 2016, there were two invitations to tender for a total of approximately 2GW. These projects should be constructed and up and running by the end of 2017 or early 2018. Mexico also predicts growth in the sector. Current figures show that only 1% of Mexico’s energy is renewable. However, it plans to increase this figure to 20% in 2018 and to 35% in 2024. Colombia currently has few farms under construction and those that are under construction are small, however the country does offer potential for the future. 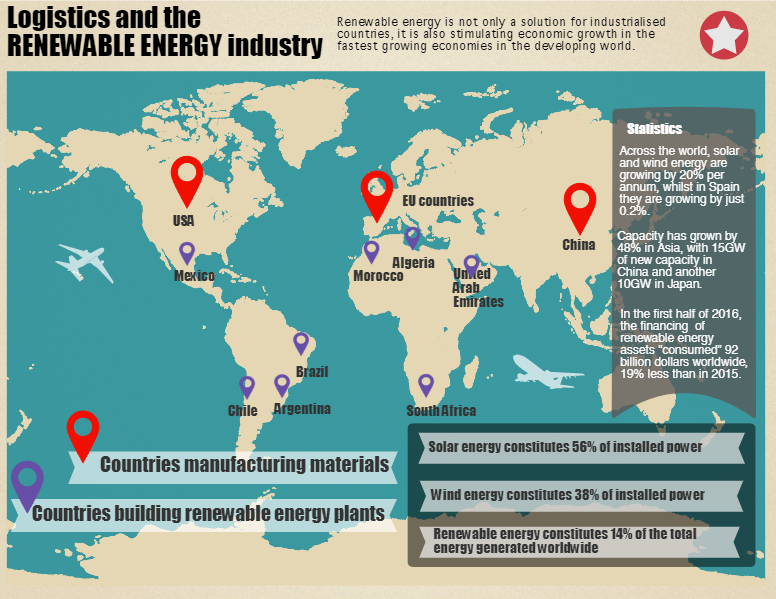 As can be seen in the picture, the main suppliers of materials and the largest builders of renewable energy plants are often located on different continents. China, Germany, the United States and Spain are among the main material manufacturers, in addition to other EU countries, such as France and Italy. Chile was one of the renewable energy pioneers in Latin America, leading the boom in terms of developing wind and solar farms. It continues to be committed to renewable energy with both large and small projects planned from now until 2019. TIBA is an efficient logistics operator for the renewable energy industry. We have offices on four continents, with Betalink branches in the USA and China, and TIBA branches in countries such as Spain, Mexico, Argentina, Chile, Panama, Guatemala, El Salvador, Portugal, Mozambique and Angola. We have an extensive network of specialist agents allowing us to offer a comprehensive end-to-end service. Renewable energies, also known as “clean energies”, are inexhaustible and increasingly competitive sources of energy that differ from fossil fuels because of their diversity, abundance and potential for use anywhere in the world. However, its distinctive feature is that they do not produce greenhouse gases -causing climate change- nor polluting emissions that could be dangerous for the planet. This energy is obtained from wind currents. The kinetic energy generated by these currents is harnessed and converted into other types of energy, especially electricity. The energy obtained by harnessing kinetic energy and the potential from water flow, waterfalls and tides. As with wind power, the kinetic energy produced by these currents is converted into other types of energy, usually electricity. This energy is obtained from the internal heat of the Earth. The heat is used to heat a substance, primarily water, which causes a turbine to turn. If you are interested in our logistics solutions for the renewable energy industry, you would like advice on how to carry out your project or you have a question for us, do not hesitate to contact us.